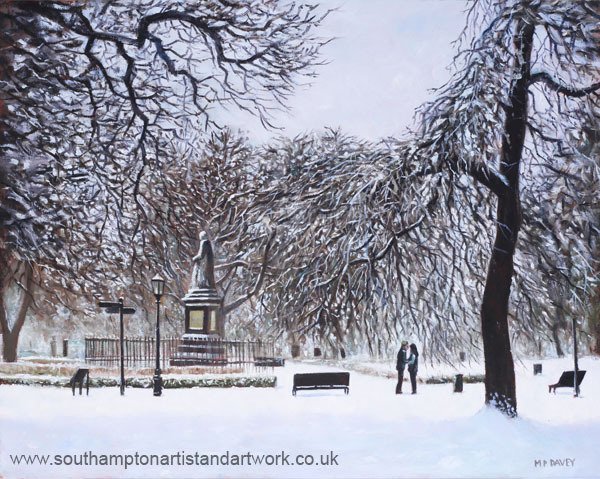 This painting was created in early 2013 and is based on a crude photograph taken with my mobile phone a few weeks before of Watts Park (also known as West Park) when covered with snow. I took a number of pictures at the time and the romantic couple seen here were added from one of those to help give a sense of scale and interest. The statue is of Issac Watts, a famous resident of the town of Southampton. Born in 1674, Watts was a leading nonconformist. I thought the dark, bare trees made an interesting contrast to the fresh white snow. The painting has a base of red acrylic paint, followed with the actual painting done in oil. It its painted at a size of 16” x 20” on canvas.